Last weekend I ventured into Evereve, a local boutique that I’ve heard a lot about but never visited. I think the name turned me off. It’s a palindrome, yes, but it just sounds weird. This boutique also recently underwent a name change from “Hot Mama” (also cringe-worthy to the nth degree) to its current moniker. Yikes. Name aside, this place is boutique heaven. (Fortunately, even if you don’t live around here, their online presence is really good). Walking in there made me feel like I was inside the world’s largest Stitch Fix box, because they featured a lot of the brands I’ve either received in a Fix or seen online in others’ Stitch Fix reviews. Think cool, unique pieces that no one else has from designers like Olive and Oak, Renee C, Skies Are Blue, Splendid, Escapada and Allison Joy. 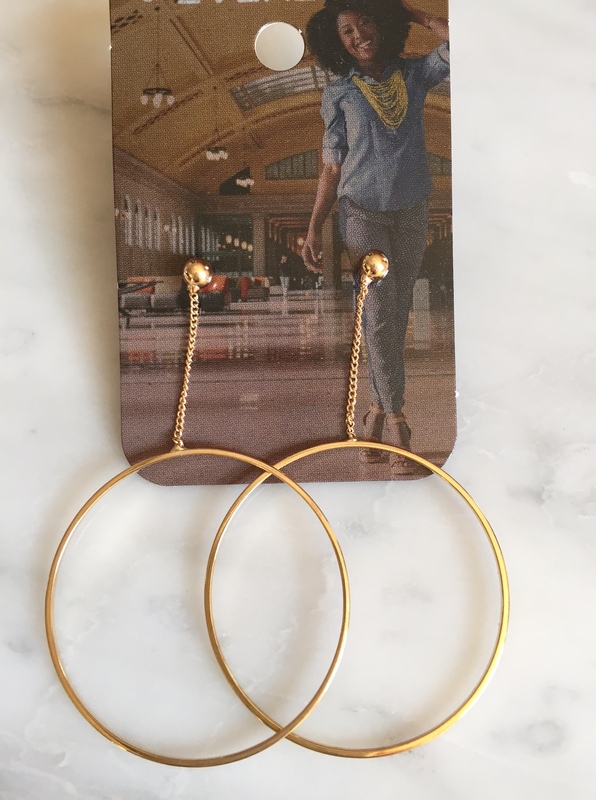 The earrings are super lightweight and feel very simple and modern. At $18, they were also a bargain. P.S. Cold shoulder tops might be big for summer.